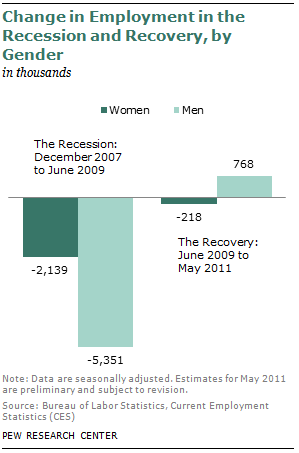 The sluggish recovery from the Great Recession has been better for men than for women. From the end of the recession in June 2009 through May 2011, men gained 768,000 jobs and lowered their unemployment rate by 1.1 percentage points to 9.5%. 1 Women, by contrast, lost 218,000 jobs during the same period, and their unemployment rate increased by 0.2 percentage points to 8.5%, according to a new Pew Research Center analysis of Bureau of Labor Statistics data. These post-recession employment trends are a sharp turnabout from the gender patterns that prevailed during the recession itself, when men lost more than twice as many jobs as women. Men accounted for 5.4 million, or 71%, of the 7.5 million jobs that disappeared from the U.S. economy from December 2007 through June 2009. Employment trends during the recovery have favored men over women in all but one of the 16 major sectors of the economy identified in this report. In five sectors, notably in retail trade, men have gained jobs while women have lost them. In five other sectors, including education and health services and professional and business services, men gained jobs at a faster rate than women. And in an additional five sectors, such as construction and local governments, men lost jobs at a slower rate than women. The sole exception to these patterns is state government, a sector of the economy in which women have added jobs during the recovery while men have lost them. A Historical Perspective: What Is New About this Recovery? From a gender perspective, the recovery from the Great Recession has defied modern norms. Women fared better than men in the first two years of all other economic recoveries since 1970. Both women and men gained jobs, with women doing so at a faster rate, immediately after the recessions in 1969-70, 1973-75, 1980-82 and 1990-91. 2 Neither women nor men gained jobs two years into the recovery from the 2001 recession, but losses for women were only half as much as for men. The recovery from the Great Recession is the first since 1970 in which women have lost jobs even as men have gained them. These cyclical patterns since 1970 have played out in an era when women have generally been gaining jobs at a faster rate than men, in large part due to their transition from the home to the labor force. The labor force participation rate, which is the share of the working-age population that is working or looking for work, increased for women from 43.3% in 1970 to 59.9% in 2000. During that period, the labor force participation rate for men decreased from 79.7% in 1970 to 74.8% in 2000. By 2000, the long-term growth in the labor force participation rate of women had ceased, and in the aftermath of two recessions in the ensuing decade, it declined. However, the labor force participation rate for men also fell during the decade—and by a greater amount. Thus, differential trends in labor market activity for women and men do not appear to be the cause of the gender role reversal in jobs lost and gained in the current recovery. It is not entirely clear why men are doing better than women in the current recovery. An analysis of employment by sectors offers no definitive answer. For example, women are more heavily concentrated than men in the government sector (federal, state and local), which has shed jobs in the recovery. 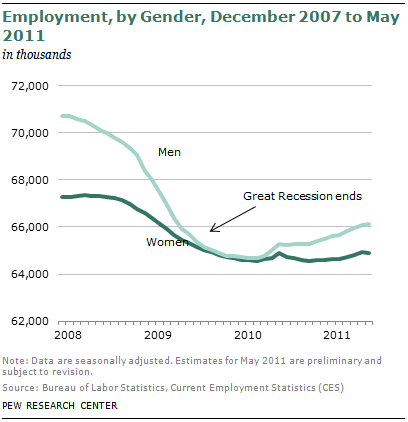 From June 2009 to May 2011, women lost 297,000 government-sector jobs, while men lost just 133,000. But this explains only a small portion of the gender gap in employment growth during the recovery. The Recession and the Recovery: Who Has Lost More? The Great Recession itself was harder on men. During the recession—from December 2007 to June 2009—men lost 5.4 million jobs and women lost 2.1 million. Job growth for men since the end of the recession has fallen well short of a full recovery. From December 2007 to May 2011, employment of men has fallen by 4.6 million. Their unemployment rate has increased from 5.1% to 9.5%. For women, 2.4 million jobs have been lost since December 2007, and their unemployment rate has increased from 4.9% to 8.5%. Thus, over the full arc of the recession and recovery to date, the weakness in the economy has been harder on men. Unemployment rates by gender have moved in tandem with employment levels. Men experienced a sharper increase in the unemployment rate during the recession. In the recovery, the unemployment rate for men has decreased, but it has increased for women. Changes in the unemployment rate for women and men transcended race, ethnicity and nativity. Men, whether Hispanic, white, black, Asian, native born or foreign born, experienced higher increases than women in the unemployment rate in the recession. The recovery has proceeded uniformly for men across race, ethnicity and nativity—the unemployment rate has dropped for all groups of men. Among women in the recovery, the unemployment rate for white women decreased, but it increased for Hispanic, black and Asian women. The unemployment rate for native-born women was virtually unchanged, but it increased for foreign-born women. This report analyzes labor market outcomes for men and women during the Great Recession—from December 2007 to June 2009—and in the first two years of the recovery—from June 2009 to May 2011. The data for this report are mainly from the Bureau of Labor Statistics (BLS). Employment trends are from its monthly Current Employment Statistics (CES) survey and encompass workers on the payrolls of nonfarm establishments. As such, farmworkers, private household workers and the self-employed are among those whose jobs are not tallied in the CES. Unemployment rate trends are from the Current Population Survey (CPS), a monthly survey of about 55,000 households conducted jointly by the BLS and the Census Bureau. The analysis of unemployment rates by race, ethnicity and nativity is based on Pew Research Center tabulations from CPS data. Data from three monthly surveys were combined to create larger sample sizes and to conduct the analysis on a quarterly basis. The time period covered by this part of the study is from the fourth quarter of 2007 to the fourth quarter of 2010. These estimates are nonseasonally adjusted, and comparisons are limited to the same quarter from one year to the next. Estimates derived by the Center from the CPS data are adjusted for annual, technical revisions to the CPS and will not match estimates published by the BLS (For details on the adjustments to the CPS data, see Kochhar, Rakesh, C. Soledad Espinoza and Rebecca Hinze-Pifer. “After the Great Recession: Foreign Born Gain Jobs; Native Born Lose Jobs,” Pew Hispanic Center, October 29, 2010 (https://www.pewhispanic.org/reports/report.php?ReportID=129). Employment trends by sector were similar for men and women in the recession—they lost jobs at similar rates in most sectors. There were three exceptions—men gained jobs in the utilities sector and state governments while women lost jobs, and women gained jobs in local governments while men lost jobs. The gender gap in jobs lost in the recession stems from how men and women are distributed across sectors. Men are concentrated in industries where job losses were most severe—construction and manufacturing—and less well represented in industries that continued to add jobs in the recession—education and health services. Trends in the unemployment rate are consistent with changes in employment levels. The unemployment rate for men increased more sharply in the recession, from 5.1% in December 2007 to 10.6% in June 2009, compared with an increase from 4.9% to 8.3% for women. In the first two years of the recovery, the unemployment rate for men has fallen from 10.6% to 9.5%; for women, it has increased slightly, from 8.3% to 8.5%. Employment trends in the Great Recession, by gender, were similar to those in the past five recessions—men fared worse than women. In three recessions—1969-70, 1973-75 and 1980-82—women actually gained jobs as they streamed from the home to the office in large numbers. Changes in the unemployment rate confirm the unique nature of the current recovery. It is the first recovery in which the unemployment rates for men and women have gone in opposite directions—falling for men but rising for women. This report was researched and written by Rakesh Kochhar, senior researcher of the Social & Demographic Trends project of the Pew Research Center. The report was edited by Paul Taylor, executive vice president of the Pew Research Center and director of the Social & Demographic Trends project. Research assistants Daniel Dockterman and Seth Motel assisted with charts and number checking. The report was copy-edited by Marcia Kramer. The author thanks Mark Hugo Lopez for his comments on earlier drafts.